witnessed "the cat-nip response". So what is this cat-nip thing? It is a flowering plant (actually, it is a mint) that belongs to the Nepeta genus (genus is a fancy name that is used to refer to a group of organisms that share similar characteristics). This plant is native to Europe, although it is also found in Asia and Africa. Europe, however, has the most diverse selection of catmints (as these herbs are also known). This herb is now very common in the United States. Since cats are very popular pets, cat-nip has become a sought-after commodity for many cat owners. This plant can be found in different guises and at most pet stores, online and offline. You can buy the seeds and grow the herb yourself; or you can buy the plant in a pot; or you can buy packages and/or containers of dry leaves. Also, you can find all kinds of cat toys filled with cat-nip. You will have no trouble finding something that will please your cat. Cat-nip contains nepetalactone, a chemical that is responsible for producing euphoria and other reactions in cats. Cats will get really wild once they come in contact with this herb: they will rub it, sniff it, eat it, lick it, and roll over it. This reaction will last for a few minutes, and then the effect will diminish until they lose interest in it. After a few hours, cats will usually regain interest in the plant and react accordingly. And if you were wondering, cat-nip is not harmful to your cat. Most cats will eat and chew cat-nip (the leaves and/or stems), but experts believe that the unique catnip-response is triggered by smelling the plant, not by ingesting it. Even though most cats will become euphoric, some cats may react a bit differently. One of my cats, for example, will get very relaxed after rubbing and eating the cat-nip. Curiously, and contrary to popular belief, not all cats are affected by cat-nip. It seems like a cat has to be genetically predisposed to the cat-nip response. It is not clear weather cat-nip also affects big felines, such as lions, tigers, and leopards. Some experts believe that this herb affects tigers but not lions. Cat-nip is not the same thing as "cat grass". Maybe you have seen cat grass advertised on many pet stores (online and offline). This cat grass usually refers to the shoots of oat, wheat, and other grains. You can buy the seeds to grow your own grass, or you can buy it in a pot, ready-to-eat. This grass does not produce the catnip-response but can be a valuable component of your cat’s diet. Go to our feline grass page to learn more. As I mentioned previously, you can find cat-nip in different shapes and forms. One of the most popular forms of cat-nip in the market is the dried leaves, which usually come in a plastic bag or container. You cat sprinkle a few leaves on the floor and your kitty will love it. Another option is to buy the plant in the pot. This is a great choice if you cat likes to eat plants around the house. It’s not only fresh, but also it will be safe for your cat. Remember that many house plants are deadly for cats, if ingested. And, of course, let’s not forget about cat-nip toys. There is a wide selection of catnip-filled toys in the pet market. You will surely find something that will please the most demanding of cats. These make great cat lover gifts too. If you prefer a "fresher" approach, then you can grow your own cat-nip. You can buy the seeds at several online retail stores. Many websites give you free instructions on how to grow this plant. And don’t worry, if you think you are no garden expert you can find complete kits that include seeds, container, and instructions. And since you don’t need a yard to grow the plant, this is also a perfect solution for city cats. You can grow cat-nip in containers, pots, and planters that can be placed indoors. This growing cat-nip article has several tips to help you grow your own cat-nip. Again, you can find a wide selection of catnip-filled and catnip-scented toys. From stuffed toys to ball toys, and from burlap bags to mouse toys, you can find something that will delight your cat. Go to our cat-nip toys page for more information on catnip-filled toys. You can give cat-nip by itself, or you can include it in a gift basket. If you are preparing the basket yourself, you can even design it around this theme –all things cat-nip- and include a package containing dried leaves, a small plant in its pot, and/or a package of cat-nip seeds, complete with instructions. An easy option would be to include a cat-nip kit, which usually includes the seeds, pot, and a manual of instructions. And, of course, don’t forget to include lots of cat-nip toys. Did you know that cat-nip essential oil can be used as a mosquito repellent? I found out just recently. A few years ago, the American Chemical Society announced that an Iowa State University’s research group found that cat-nip essential oil is more effective than deet in repelling mosquitoes. This same group also reported that cat-nip essential oil can repel cockroaches. According to researchers, nepetalactone is not harmful to humans. You can find cat-nip essential oil at aromatherapy stores. Also, some people use cat-nip as a spice and to tenderize meats, others use it to make tea, while others use it as a natural remedy to combat the common cold and even fever. However, there is no definitive evidence that shows that cat-nip possesses any healing qualities. Growing cat-nip - Lots of tips and information. 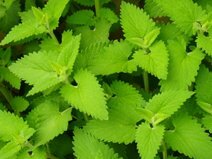 Cat-nip plants - Characteristics of this minty herb. Cat-nip toys - Your cat will love these playthings! More cat-nip toys - Make your own cat-nip toys. Find several ideas here. Cat-nip tea - Information about the benefits of cat-nip tea plus instructions on how to make this delicious herbal tea. Cat grass - Why cats love it.